Dumplings are the ultimate comfort food, and a great way to take a trip around the culinary world. Nearly every cuisine features some form of dumpling, and we're fans of them all — Polish pierogis, Chinese dim sum, Caribbean cornmeal dumplings, and even Jewish matzo balls (yes, those are dumplings, too). Whether steamed, boiled, or fried, savory or sweet, doughy or light as air, served in a soup or eaten with a sauce, there is something to love about every type of dumpling. We've collected our favorite recipes from around the globe, in this food enthusiast's guide to dumplings. 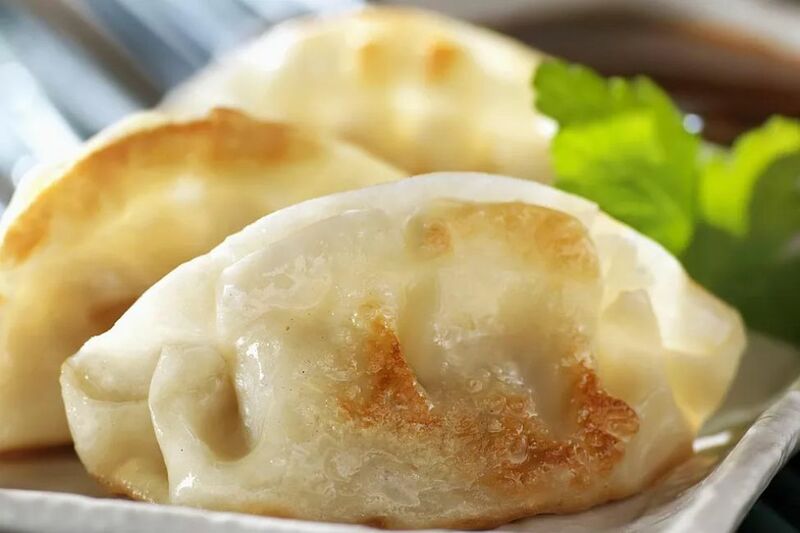 Chinese dumplings (jiaozi) filled with ground pork or beef, cabbage, bamboo shoots, scallions, ginger, and garlic are a popular dish at dim sum restaurants, and Chinese New Year celebrations. Serve them as an appetizer, with an easy tangy dipping sauce made from soy sauce and rice wine vinegar. Caribbean cornmeal dumplings are airy and light, with a hint of sweetness and spice from cinnamon and sugar in the batter. They make a delicious addition to fish chowders, oxtail soup, or just about any Caribbean stew. Steamed wonton-style dumplings filled with sliced chicken, shiitake mushrooms, and Thai flavorings, make a wonderful light dinner in summer, or a winning buffet appetizer with the included dipping sauce. Polish pierogi dumplings have gained worldwide popularity in recent years. What's not to like about soft, doughy dumplings with savory a potato and cheese filling? Make a big batch in about an hour, to enjoy topped with sour cream, and optional crumbled bacon. Similar to Italian ravioli, Turkish meat dumplings (manti) are a tasty national dish with a storied history. Use store-bought wonton wrappers to enclose the homemade spiced meat and onion filling. Boil these savory parcels in broth, and serve with a delicious mix of garlic-infused yogurt and sweet, tangy tomato sauce. Vegan and vegetarian pumpkin-filled dumplings make a fabulous first course for autumn dinners, or an inspired appetizer for Halloween parties. Make them easily using canned pumpkin puree and a few other ingredients. Hearty, football-shaped zeppelin dumplings are a popular dish in Lithuania. To make them, potatoes are grated along with onion and formed into a dough, then filled with meat, boiled and served with sour cream. Delicate, steamed shrimp dumplings, lightly seasoned with rice wine and sesame oil, are one of the most popular items on dim sum menus. Make them at home with this recipe and an expert tip: Keep both your hands and the steamer basket well-oiled, to prevent the dumpling dough from sticking. Yeasty, round dumplings simmered in sweetened milk, and doused with rich vanilla sauce are a German delicacy you can make at home and enjoy for a continental-style dessert. They are best eaten immediately after cooking. The dough for these plum-filled dumplings is formed with mashed potatoes, making this a uniquely sweet-and-savory dish that can be enjoyed as an unusual dessert, filling snack, or fruity holiday side dish. These miniature savory soup dumplings, called "little ears" for their shape, are typically filled with meat. This equally tasty recipe calls for a delicious mushroom, breadcrumb and parsley stuffing, making them suitable for vegetarian diets. Chinese sticky rice dumplings are like an entire nutritious meal wrapped up in a neat package. Sticky rice is stuffed with chicken and shiitake mushrooms, wrapped in banana leaves, and steamed or baked until piping hot. Apple dumplings are a comforting fall fruit dessert. This recipe encloses lightly-spiced apples in homemade pastry dough, bakes them in the oven, and finishes them with a delectable, buttery cinnamon syrup. These simple, delicious little German-style dumplings are incredibly easy to make, and add a wonderful touch of comfort to your soups and stews. Make a big batch in 30 minutes and freeze ahead, for using any time. These sweet little boiled rice dumplings rolled in coconut shreds, sugar, and toasted sesame are eaten as a snack in the Philippines, but you could easily serve them for dessert. You just need 15 minutes and a handful of ingredients for this easy recipe. Cantonese-style steamed dumplings filled with ground pork and bok choy have a wonderful texture thanks to the cooking technique. They're steamed on one side, and pan-fried on the other, for a chewy-crispy experience you'll go back to again and again. Enjoy them as a hearty appetizer, with soy sauce or rice vinegar for dipping. Deep-fried vegetarian wontons make a great party appetizer that you can prepare in less than 20 minutes. The yummy filling is made with tofu, water chestnuts, and a few other vegetables. Traditional Czech bread dumplings are simple to prepare using stale bread cubes, flour, milk, and eggs. The easy dough is shaped into small loaves, which are boiled, and sliced for serving. Enjoy them in stews, or as a side for meat dishes. Enjoy steamed pork dumplings flavored with Indian spices in a bowl of clear broth for a comforting lunch or light dinner, or as a main dish, topped with spicy tomato sauce. Make them in under an hour, and serve immediately. Matzo balls are soft, fluffy dumplings made from matzo meal that are traditionally enjoyed on Passover, floating in chicken soup. This recipe produces matzo balls with the perfect texture, and boosts their flavor with a little za'atar seasoning. Flavorful pork and shrimp dumplings are a popular dim sum dish, and surprisingly easy to make at home. Form them with ground pork, and a filling of minced shrimp, mushrooms, and Chinese flavorings, rolled in wonton wrappers and steamed. Make the dough and filling for these savory Russian meat dumplings up to a day ahead, for boiling quickly just before serving. They taste great topped with melted butter, red wine vinegar, or sour cream. These simple, butter-rich dumplings are easy to make in about 20 minutes, using your food processor and a handful of pantry ingredients. Enjoy them in a classic dish of chicken and dumplings, or in your post-Thanksgiving turkey soup. Ukranian boiled dessert dumplings are similar to Polish pierogi, but are filled with fresh, ripe blueberries. Feel free to add a splash of brandy, or lemon juice, to the berries, and serve dumplings topped with the included blueberry sauce. Nutritious vegetarian dumplings are a popular Korean dish. They typically include tofu, eggs, glass noodles, and vegetables, but you can vary the veggies to suit your tastes. The dumplings can be steamed, pan-fried, deep-fried, or boiled in soup. The Polish name for these traditional boiled dumplings means "little hooves," for their shape. They are easy to make with cooked mashed potatoes, and have a texture similar to Italian gnocchi. These meat-filled German dumplings take some effort to prepare, but the reward is great flavor. They use an egg noodle dough, and are filled with a mixture of beef, bacon, spinach, fresh breadcrumbs, onion, garlic, and spices. Vegans and vegetarians can enjoy Asian-style potstickers with this meat-free recipe. They're extra-hearty thanks to a savory filling made from crumbled tofu, mushrooms, napa cabbage, ginger, garlic, scallions, soy sauce, and sesame oil. Sliced peaches are topped with lightly sweetened dumplings and simmered on your stovetop for a delicious fruit dessert that's easy to make. Feel free to use thawed frozen peach slices if fresh peaches aren't in season. Jamaican spinners are dense dumplings that require only 3 ingredients. The dough is shaped into long, tapered strands that spin and sink while they cook, instead of floating on top of liquid. Enjoy them cooked in soups or stews.